This entry was posted in Featured Work, Why We Write, Women Writers, Writers & Readers: Community Forum and tagged American Literature, American women writers, Didion documentary, Griffin Dunne, Joan Didion, Mount Holyoke College, Reading Lists, women writers by Sandi Sonnenfeld. Bookmark the permalink. Thanks for sharing, Sandi. It’s unfortunate that Didion has only 2 women writers on her list (and a rather odd choice for Oates AND for 19th century fiction—I would have pegged her as an Austen lover): curious if the list would change if she included more contemporary works. Stacey: She actually has three on her list–Renata Adler’s Speedboat, a novel which I’m not yet familiar with, but plan to read now that Didion included her on this list. I suspect that like most writers, it was books she read when she was still in her teens and twenties that most influenced her, and given that back then the literary canon didn’t often include women writers, I’m not that surprised her list has fewer women writers than one might expect. And given that Didion was hugely interested in politics, foreign policy and international relations in the early days of her journalism career, it is also not surprising that she was drawn to novels that covered such themes. 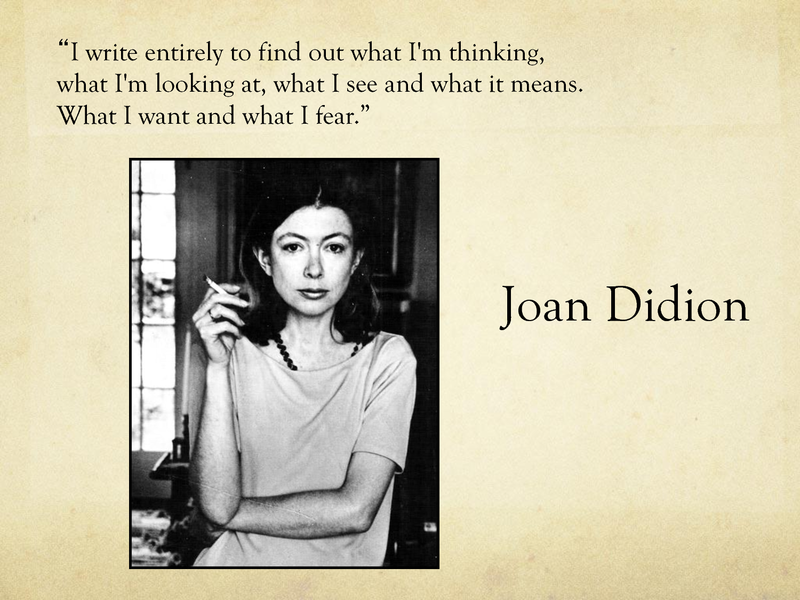 Now far more women are writing and publishing about such themes, and Joan Didion is one of the role models who helped us get there. Good points, but Tess Slesinger, Tillie Olsen, and Mary McCarthy (among many other women writers) were writing about politics since the 1930s. Sorry that I missed Adler’s novel: I’m not familiar with it, either, though it sounds fascinating. But it came out in 1976, and Oates’ novel in 1971: not all of these are works that Didion read as a teenager.